The old adage is as true in beekeeping circles as it is amongst poultry breeders. There is many a slip during the harvesting process, which can result in a much smaller crop than expected. Bees or wasps can find a way into supers, which you thought you had sealed securely, and carry away pounds of “your” honey. You accidentally knock the tap open on the honey extractor, just before you put a bucket under it, and if this happens in the kitchen, it can put a substantial strain on what was otherwise a perfect partnership. So we need to consider the process carefully. The act of harvesting honey includes removal of the crop from the hives, and the extraction of the honey from the combs. Before we can take our honey from the hives, we need to remove the bees from the combs causing them the least stress and disturbance. If only a single super is involved, this can be achieved by shaking and brushing the bees from the frames onto a ramp placed in front of the hive where they can run back in through the entrance. Needless to say, this is not entirely stress and disturbance free, so it is not the usual practice where more than one super is concerned. The more usual method of clearing bees from supers is by the use of a clearer board. There are several types available including the spring type (Porter Bee Escape) where the bees push their way between springs which close behind them, cone escapes where the bees have wide exit points but narrow re-entry, and rhomboid type, where they are directed through channels to the periphery of the hive, and fail to find their way back. When using Porter Bee Escapes careful attention should be paid to the springs before use, for if the gap between the springs is too large, the bees will of course get back in. The clearer board should be placed between the supers and the brood chamber, but if the colony is particularly strong, or there is still nectar coming in, then you may wish to put another super above the queen excluder to allow the bees more space to clear into. Once the clearer board has been inserted, and the hive rebuilt, it is then important to ensure that the bees cannot gain access to the supers from the outside. Any small gaps in the supers should be sealed, and it is often good insurance to run some parcel tape around the joints. The feed holes in the top crown board should be covered, as it is not unheard of, for the bees to find a way up under the roof. The hive can then be left alone for one or two days, depending upon the number of supers to be cleared. During this time, the bees will find their way down through the escapes to join their queen and brood below, and then the beekeeper can remove the harvest to a bee proof area to await extraction. It is helpful if this area has a window which opens, as very few clearer boards are a hundred per cent effective. There are invariably a few bees left in the supers, and if released, they will fly to the window from which they can be ejected. This is best done in the evening, for these bees will return to their hive with the news that there is free honey in a window just around the corner, and the area will be deluged with foraging bees intent on getting their honey back. Unless you are fortunate enough to have a purpose built honey room, honey extraction usually takes place in the kitchen. Before starting, the floor will need protection from the inevitable drops of honey and the odd pieces of wax and propolis. Newspaper is suitable for this, or sheets of cardboard, or any other absorbent material that will soak up any spillages. In dealing with a delicate food like honey, hygiene should come high on the list of priorities. An overall or apron should be worn to protect you from the honey, and the honey from you. All utensils should be made from stainless steel, or food grade polythene, and water should be on hand to wash constantly sticky fingers. When the supers are brought in, an upturned hive roof or tray is useful to stand them in, to catch any drops from fractured combs. A second one, and a spare super can be used to receive the wet frames following extraction. An uncapping utensil is required. This is usually a knife or an uncapping fork. If using a knife, it will slide through the wax easier, and have fewer cappings clinging to it if it is kept warm. Having a receptacle of hot water nearby, and two knives, one being used, and one being warmed in the hot water can achieve this. On removal from the water, the knife should be wiped dry before use, to avoid adding any excess moisture to the honey. Some people like to uncap running the knife upwards, and some prefer downwards, but which ever way is preferred, great care should be taken to keep fingers and hands guarded. The frame is uncapped holding one of the lugs, while the other one is rested in a non-slip position on the uncapping tray. An uncapping tray is a very useful device when dealing with several supers, but if only two or three are involved, then a smaller receptacle, such as a tray or a meat dish, will suffice. The uncapping process involves running the knife just under the cappings, removing as little as possible, in order that there are not masses of cappings to deal with later, and the thickest comb possible can be returned to the bees. In selecting the combs for uncapping one invariably finds that not all the cells are capped. The reason for this is that the bees have not been given sufficient time to reduce the moisture content adequately, and if too much of this is included in the extracted honey, we run the risk of fermentation in our stored honey. A general rule of thumb is that if the frame is seventy five per cent capped, and when held horizontally no honey shakes out from the unsealed cells, then it is ripe enough to extract. If however, a large part of the frame is unsealed, or loose honey does shake out, then any such frames should be placed in a separate super, and returned to the bees for them to complete the work. This might result in the bees using this honey themselves, but that is much better than ending up with buckets of fermenting honey. ​When loading the extractor, it is advisable to place consecutive frames on opposite sides of the extractor. Consecutive frames in the super are usually of a similar weight, and if the extractor is well balanced, it will preventwobble during rotation. There are two types of extractor, radial and tangential. 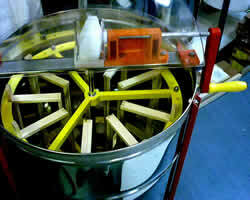 In a radial extractor, the frames are placed in position radiating from the centre like the spokes of a wheel, with the top bars furthest from the centre. Utilising the slight upward angle of the cells to the midrib of the comb, both sides of the frame can be extracted at the same time, using a slow rotation to begin with, and then speeding up as the combs empty and become lighter. Using the tangential extractor involves placing the frames within a cage, where they rotate at a tangent to the centre. This results in greater centrifugal force being placed upon the honey in cells on the outer side of the comb, but the honey on the inner side is being forced against the midrib, and great care must be taken that the comb does not fracture. The usual procedure is to rotate the first side slowly, and partially empty the cells, then turn the frames over, and fully empty the second side, then turn them back and complete the extraction of the first side. Once again, the angle of the cells can be utilised to good effect by positioning the frames so that the bottom bars lead the rotation. The extracted honey can be run from the extractor into honey buckets. It will then need straining through a course strainer to remove any pieces of wax, and a straining cloth to remove minute particles of propolis etc. This process can be greatly facilitated by gently warming the honey for a few hours, when it will be liquid enough to pour straight through both mediums. It is then caught in a suitable receptacle, and allowed to stand for twenty four hours, to allow all the air bubbles obtained during the process, to rise to the surface, where they can be skimmed off. A honey tank, which incorporates a strainer at the top and a honey valve at the bottom, is ideal for this, but again, if smaller quantities are involved, then smaller solutions should be found. Colanders and kitchen strainers can be useful in these circumstances. The honey can then be either bottled, or run into clean honey buckets to be stored. The cappings can then be dealt with, as there is usually a substantial quantity of honey left in them, and the wax itself is valuable. If a small amount is involved, then once again the colander or kitchen strainer can be utilised to drain the honey from the cappings. This can be achieved by leaving to drain over night, in a warm room, into a suitable receptacle. This honey should be dealt with in a similar manner to that which came from the extractor. The remaining cappings can be spread out on a tray, and placed over the crownboard of a hive, where the bees will come up through the feed holes, and clear all traces of honey, leaving dry particles of beeswax which can be taken away and rendered. If an uncapping tray is being used, the cappings should be left on the tray for twenty-four hours, for as much honey as possible to drain away. Then, if it is a heated tray, the element can be switched on to melt the wax and run off any trapped honey. In order to do this, a honey/wax separator should be placed beneath the tray outlet. At this point two anomalies should be considered. One concerns pollen and the other granulated honey. Most of our bees do not follow the rule of putting pollen only in the brood chamber. Invariably, we find some stored amongst the honey in the supers. This is not a huge problem, as the pollen does not usually spin out during the extraction process, but it does sometimes have the effect of unbalancing the extractor, causing the machine to wobble during rotation. This can be overcome by moving frames around to rebalance the load. ​Granulated combs are a rather more difficult problem to deal with; as such combs will not extract using the usual technique. It is usually discovered during the uncapping process, and sometimes involves a part of the comb, and sometimes the entire frame. When granulation is discovered, an assessment of the frame must be made, and a decision reached, as to which is the most valuable, the honey or the comb; as to harvest the honey, the comb must be forfeited. If there is only a little granulated honey in an otherwise extractable frame, then one might decide to extract what is possible, and return the rest to the bees. If, on the other hand, the bulk of the comb is granulated, then the honey might be considered more valuable than the comb. The only realistic way of then harvesting this honey is by the use of a heated uncapping tray. The entire comb is cut out of the frame and placed on the tray, where both honey and wax will melt and run into the separator. When extracting is finished, we are left with supers of very sticky frames. These are best dealt with by returning them for the bees to clean up. During the evening, when the bees have finished flying for the day, the roof can be removed, and wet supers stacked above the crownboard, so that the bees can come up through the feed holes, clean up our wet frames, and take any honey they can glean, back down into the hive. During this process care must be taken not to start robbing. A crownboard should be placed on top of the wet supers, with the feed holes covered, and any gaps or loose joints in the supers should be sealed. The entrance to the hive should be reduced, to make it easier to defend against opportunistic robbers. The supers can be left in place for two or three days, depending on the number of supers to be cleaned, and the strength of the colony doing the job. After this, they can once again be cleared of bees, and taken away to be stored, and the use of Certan will ensure that they remain immune to attack by wax moths until they are next required. ​CAUTION: Moth balls and crystals (naphthalene) should not be used to control wax moth. PDB is no longer an approved substance to use as it is readily absorbed and can lead to significant traces remaining in wax which can then migrate into any honey that is subsequently stored in them, and, though the bees do not object to this odor, such honey is unfit for human consumption. An alternative method is to freeze the supers at zero degrees C for twenty-four hours to kill the larvae.